Famous people who were prisoners on Alcatraz Island include Al Capone, Machine Gun Kelly, and the "Birdman of Alcatraz" - Robert Stroud. The "Birdman of Alcatraz" was not allowed to have pets on the island. He had his birds when he was at Leavenworth Prison. In 1963, a few Alcatraz prisoners attempted to escape from the island. They are believed to have died in the attempt. No bodies were ever found. The old Alcatraz penitentiary claimed that no prisoner successfully escaped. There were a total of 14 escape attempts. In 1969, a group of Native Americans chartered a boat and landed on Alcatraz. They occupied the then abandoned island until 1971, carrying out various protests against federal policies directed at Native Americans. Alcatraz Island often appears in popular culture. It is especially known for appearing in movies, with examples including Birdman of Alcatraz (1962), Escape from Alcatraz (1979), The Rock (1996), and Catch Me If You Can (2002). Alcatraz Island is legendary in American culture, primarily because of its role as a maximum security prison from 1934 to 1963, during which time it incarcerated such notorious outlaws as Al Capone, "Machine Gun" Kelly, and the pop-culture hero known as the "Birdman of Alcatraz." It has a lesser-known history as an internment center for Native American members of the Hopi tribe, who were mis-identified as "savage Apaches" in news articles. They were incarcerated in 1895 after protesting against having their children forcibly sent away to schools in the East. In more modern times, Alcatraz made news again when other Native Americans occupied the island from 1969 to 1971 to protest government policies. Today, the island is open for tourism and is one of the best places to view the stunning San Francisco skyline. In 1775, Juan Manuel de Ayala became the first Spaniard to document the island of Alcatraz. Upon his arrival, he did not encounter any resident Native Americans. This is because the Native Americans in the region considered Alcatraz to be cursed. Ayala named Alcatraz "La Isla de los Alcatraces," or "The Island of Pelicans," due to its resident pelican population. The Spanish erected a few small buildings on the island, but nothing much became of it in relation to any subsequent settlements. From the 1850s to 1933, Alcatraz served as a military fortress and military prison. It was actually the first U.S. fort on the West Coast. In 1934, the island and its various installments became a federal prison. Given the task of housing prisoners who continuously caused trouble at other federal prisons, it retained this role until 1963. After the government shut down the federal prison on Alcatraz, the island was abandoned. It remained abandoned until 1969, when a group of Native Americans arrived on its shores and began a relatively short-lived occupation. The main purpose of this occupation was to protest federal policies as they related to American Indians. The Native Americans were forcibly removed by the U.S. government in 1971. One year later, the island was handed over to the National Park Service, which retains ownership to this day. 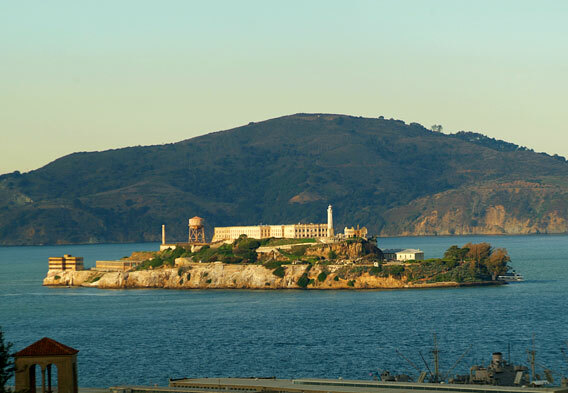 The island of Alcatraz is part of the Golden Gate National Recreation Area. This area surrounds the San Francisco Bay area and is as diverse as it is large. This is actually one of the largest urban parks in the world. It is made up of a collection of areas, rather than one continuous area. 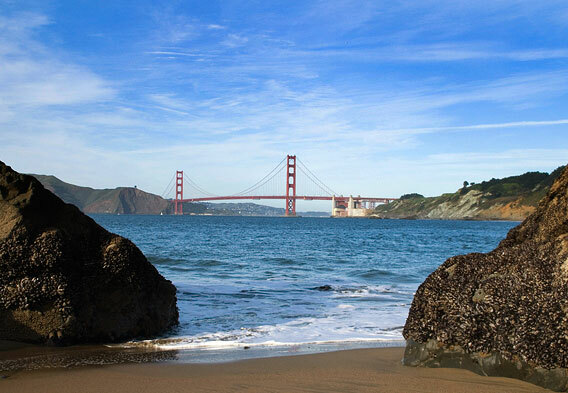 Examples of its other numerous fixtures include China Beach, the Presidio of San Francisco, the Fort Point National Historic Site, the Muir Woods National Monument, the Point Bonita Lighthouse, and Stinson Beach. Hiking and biking are among the activities that Golden Gate National Recreation Area visitors come to enjoy, and the sightseeing is certainly spectacular. Most of the Golden Gate National Recreation Area is open to the public with no access fees, and campsites are found within the park boundaries for those who wish to take advantage. Access to Alcatraz Island is provided by a private ferry company that is under contract with the National Park Service - Alcatraz Cruises LLC. The operating hours for the ferries and the island itself vary with the season, though generally speaking, the ferries depart approximately every half hour beginning at nine am and ending around four pm. Night tours are also offered on a seasonal basis. Summer is the most popular time to visit, and since tickets are limited, it is recommended that any prospective visitors purchase theirs well in advance. Those who wait to purchase their tickets until they arrive in San Francisco can try their luck at the Hornblower Alcatraz Landing ticket office at Pier 33. Including the boat rides, tours of Alcatraz tend to last about two and a half hours and include audio tours. Guided tours can also be arranged. Alcatraz is open every day except Christmas, Thanksgiving, and New Year's Day. Tour guests should arrive at least 20 minutes before their boats depart, and it is a good idea to wear comfortable shoes. A jacket or sweater is also worth bringing, as it can be cold and windy even on summer days. A beverage and snack bar can be found on each ferry. Tour guests are also allowed to bring their own snacks and drinks. Only water is available on the island itself. As a side note, there are relatively short boat tours that just circumnavigate Alcatraz Island for those who don't want to go ashore. 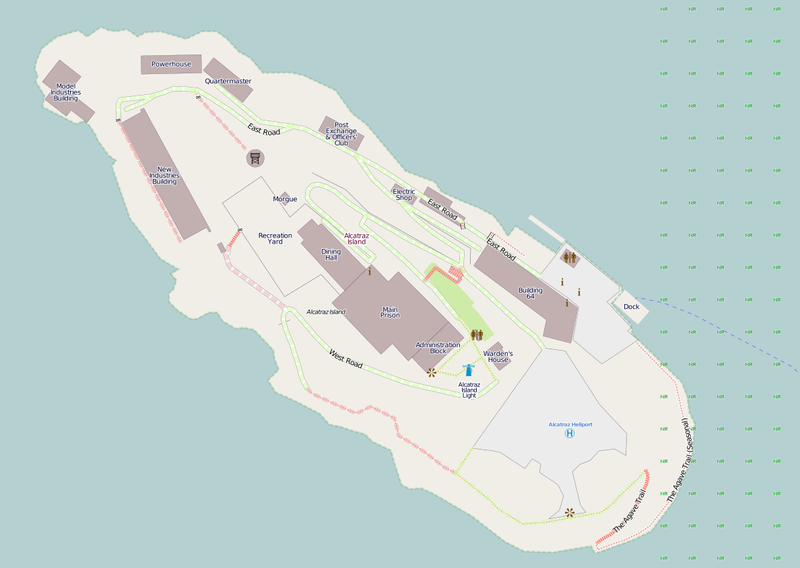 Consult an Alcatraz map, and you will notice that the Main Cellhouse lies in the island's center. This cellhouse was where the prisoners were held and is a major Alcatraz feature. Visitors can also stroll through the old prison Recreation Yard, which is found just off the Main Cellhouse. This enclosed yard was used by prisoners for recreational purposes between the years of 1934 and 1963. Games that were played within its realms included baseball, softball, and chess. Occasionally, violence occurred in the Recreation Yard, and it was also a place where inmates like Machine Gun Kelly and Basil "The Owl" Banghart would discuss such things as the criminal escapades that landed them in Alcatraz. 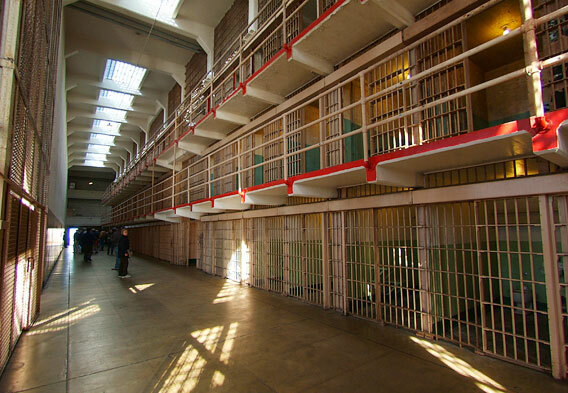 In general, inmates were allowed to use the Recreation Yard on Saturdays, Sundays, and holidays. The privilege could be revoked for bad behavior. The Alcatraz lighthouse and the Parade Grounds are just two more Alcatraz features of interest. The lighthouse is actually the oldest lighthouse on the West Coast. It was built in 1909 to replace a previous lighthouse that dated back to 1854. The Parade Grounds is a large concrete open area on the south end, built in the 1860s, and used for such things as military parades and drills. It was also a special event venue and playground for kids of Alcatraz employees. Today, the Parade Grounds area is used as a heliport. Roads and walkways lead around and through Alcatraz Island, and some portions offer closer looks at the more natural side of things. Among the natural spots are the western cliffs and cliff tops, which provide nesting and roosting sites for various bird species, including pigeon guillemots, Heermann's Gulls, Western Gulls, and cormorants. At the base of the cliffs, harbor seals can sometimes be seen on a small beach. Other areas on Alcatraz Island serve as habitats and breeding grounds for black-crowned night herons, Western Gulls, deer mice, and salamanders.